Spring is in the air, little green things are popping up all over, and we all heave a sigh of relief that the blanket of white stuff is finally gone. But beneath the snow that stopped everything in its tracks lurks a hardy, robust little puff of tiny green leaves that virtually grows before your eyes. Call it what you will - hairy bittercress, winter bittercress, hairy cress, popping cress - Cardamine hirsuta - is a weed that tries the most forgiving gardener's patience. Growing worldwide (except in the Antarctic, this genus of the Brassicaceae family numbers more than 150 species, both annual and perennial. 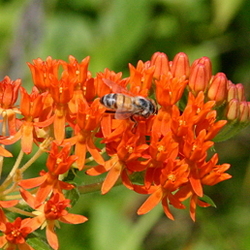 The plant is self-pollinating and in bloom throughout the year. 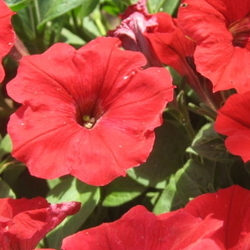 It loves moist soil and grows aggressively under those conditions. As the snow melts, tiny white, pink, or lavender flowers begin to appear. Yes, flowers. This tenacious weed is short-lived, which is good, you say. A life cycle of 6 weeks doesn't seem like such a big deal. Think again - how many 6-week cycles are there in a year? One of the biggest problems with bittercress is that, by the time you discover you have a problem, it's almost too late to do anything about it. The first flowers appear in late February or early March, quickly form seed pods, and mature. If you touch those trigger-happy seed pods, it's all over - the pods explode, distributing seeds over an area up to 36 inches around each plant. Those seeds will germinate and begin sprouting with a few days and the cycle begins again, only over a larger area. Small to medium size plants produce about 600 seeds, and larger plants can yield up to 1,000 seeds. 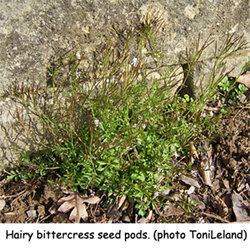 Hairy bittercress is not invasive enough to warrant using herbicides. As soon as new plants appear in February or March, begin pulling them; these are the offspring of the previous fall's seed crop. Through the season, always pull the seedlings when you see them; they have shallow roots and come away quite easily; however, bits of root left behind are capable of re-rooting under optimum conditions. The key is to get the plants before they set seed, which happens quickly after blooming. Eradicating this weed from large areas is almost impossible, unless you can hoe and remove. Keeping bittercress out of the flower beds is a little easier, but requires diligent hand-weeding to stay ahead of the seed formation. The leaves release a pungent aroma when bruised. Hairy bittercress is a problem in greenhouses and nurseries, so be sure to clear off the top 2 to 3 inches of soil before planting anything you purchase. Scoop the soil into a plastic bag and dis card. Keep a close watch on newly planted containers, especially those that are positioned near flower beds. The propulsion factor of bittercress seeds can sneak new plants into your containers while you aren't looking. 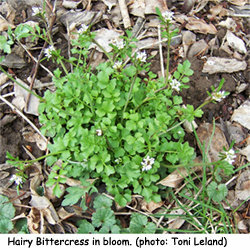 Hairy bittercress is a real problem near flagstone patios or walks, brick work, or any hard-scaping that has space between the pieces. 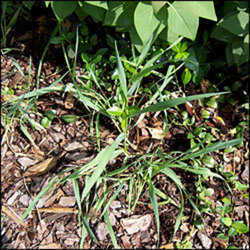 This weed does not need much to set down roots - even a small amount of sand between two bricks is plenty. As mentioned before, at least the seedlings are easy to pull.